This was a really fun recipe. I used Betty Crocker Milk Chocolate Cake Mix with Betty Crocker Milk Chocolate frosting. I also added 1 cup of pecans to give it more texture. Make sure you allow the cake mix to cool down about 30 minutes before adding the frosting, otherwise the cake mixture will get too mushy. I did notice that I had to use way more confectioners coating then what was stated in the recipe. I actually used two 16 oz packages of confectioners coating instead of the 3 oz bar. I am not sure what I was doing wrong but that was a huge difference in chocolate. 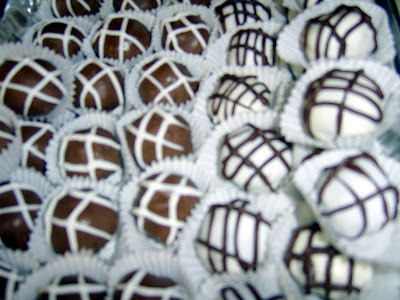 Then I drizzled milk chocolate confectioners coating over the white balls and white chocolate coating over the milk chocolate balls. Overall, these truffles turned out really good.